Few days back We published an article about the postponement of RRB NTPC (Graduate) 2016 online exam. Many of aspirants said that it's a fake news and we are trying to spread rumours to them. Unfortunately it hurts us! We never spread any fake news and never provide any wrong information. Need proof? Railway Recruitment Board has published about the postponement of online test and also released the list of exam centres where the online exam has been rescheduled. RRB has released the list of exam venues where leakage of papers before the exam has been found. Most of the centres are belong to Allahabad, Delhi and Pune. The online test which was held or going to be held between 26.04.2016 to 30.04.2016 has been rescheduled. The examination for other centres will be conducted as per schedule. For Official Notification about the exam centres and rescheduled of online test, check here. So, we are not wrong at all. We have proved that. We believe in trust. Trust is our wealth. Keep faith on us. We will never misguide you. That's our promise. 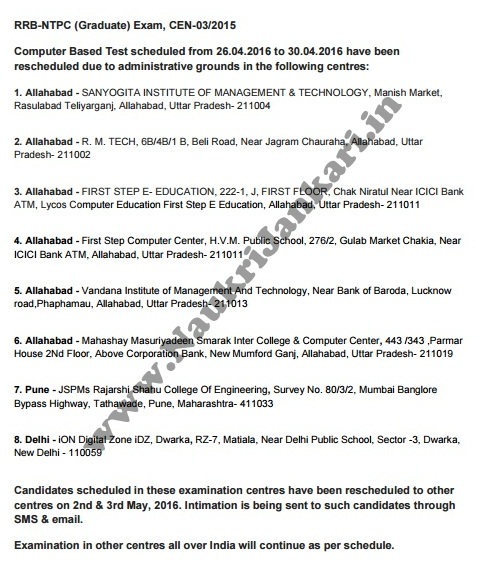 0 comments for " Centres where RRB NTPC 2016 Exam Rescheduled "